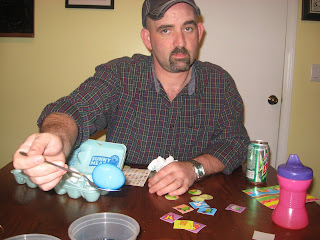 Easter is tomorrow so we spent our family time tonight letting our creative juices flow as we dyed Easter eggs. I have probably 30 plastic eggs that I plan to fill with pennies, nickels, and dimes for the kids to find tomorrow but we'll also hide our decorated eggs - which are Javi's favorites to find. Even Daddy got in on the act. His egg was the prettiest of the bunch! 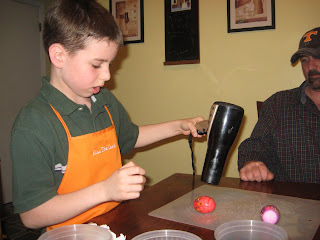 Javi loved using the hair dryer to shrink the egg wrappers. 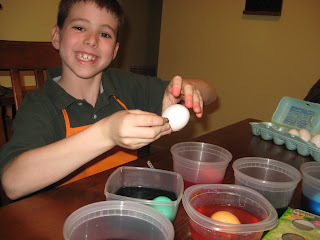 I think if it were up to him, we would've used egg wrappers on all of the eggs. Instead, I'll be putting stickers on them after they've dried all the way. 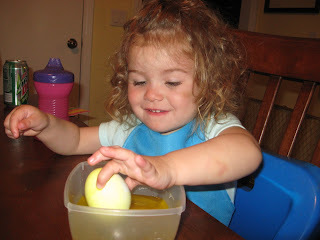 Grandma, Nana, and Poppie are coming over tomorrow to watch the kids find their eggs, so we have some time to get them ready. I hope the Easter bunny is good to everyone!